Maternity leave flies by,the weather begins to get warmer and even though I can finally fit my giant post-pregnancy feet into normal shoes, I’m even more conscious of the fact I have thus far failed to shift the “baby weight”. Well, to be honest I think I am just using baby weight as an excuse now that she’s nearly 5 months old! It’s just plain old weight! 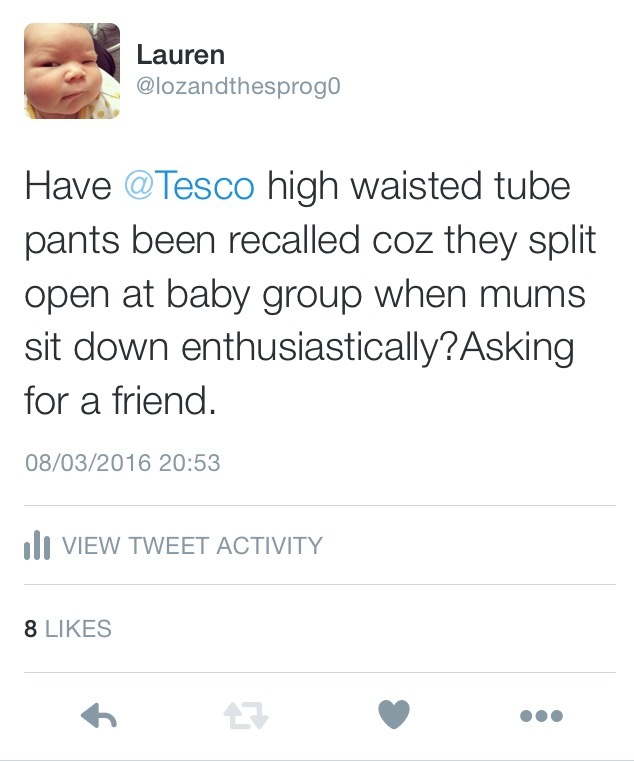 The other week, I over-enthusiastically sat down on the floor at a baby group and split my trousers. As hilarious as it was (thank you twitter for cheering me up!) and as much as I would love to blame the trousers, enough is enough! So I’ve decided to take action for the sake of my soon to be worn again work trousers. I cannot be getting my arse out at work. Not just for the hell of it anyway-giving birth didn’t count. Operation move more eat better has begun. Right after this cheesecake I have in front of me has been devoured. So I got thinking. I needed to find an easy “beginners” type exercise to get me going. Something I could do with the baby. Something maternity pay friendly. Something like walking! My current exercise regime consists of walking to the fridge and back, lifting the baby and speed eating in between baby naps. So I’ve decided to start off with small steps. Or rather, increasing my small steps. I intend to walk a 10k with my pram so the best way to get some practice in is to…well, walk! So beginning this week, I’m going to try and up my steps per day. Small things like walking instead of taking the bus. Or getting off the bus a stop early. Having nice afternoon strolls whilst she has her afternoon nap in the pram. It all adds up, and hopefully I can get a bit fitter along the way. I saw a fantastic advert for Cancer Research’s Race for Life and this gave me inspiration. Why not have a goal to work towards to encourage me to keep walking more? I will get fitter in the run up to the big race day and the obvious bonus is that it’s in aid of a charity. Cancer Research UK is a charity close to a lot of people’s hearts as cancer is something which most of us will unfortunately have experience of in our lives. There is a unique atmosphere at Race for Life events. I think my favourite part is the messages on the backs of runners, joggers and walkers. Making my way along the route, they are always something I enjoy reading- some are in memoriam, others a personal message of victory. I have taken part in a few races for life and have always had a brilliant time. I’ve managed to grab a few other mums to join me. I find group activities are 10/10 for motivation because I never want to be the one who lets the team down! Who doesn’t love peer pressure driven fitness goals? If you haven’t signed up for race for life before and want to join in, it’s really easy to book! Just follow this link, and then choose the nearest venue to you. You can enter as an individual or as a team. You can run, jog or walk so it’s pretty much suitable for all abilities. Some venues are wheelchair and pushchair accessible making them even more inclusive. I’m taking my daughter in her buggy and the other mums I have roped in are bringing their offspring in buggies too! Also, all money raised can be donated online so there’s no messing around having to collect sponsorship afterwards, your sponsors can do it via a donation page! Does anyone else fancy a nice long walk in a park for charity in the sunshine*? Or is anyone planning to *gulp* run one? Have you got a team fancy dress theme or uniform planned? Do you intend to make a day of it? I’m absolutely definitely planning to picnic in the hopefully glorious weather afterwards! You are more than welcome to join me! *sunshine not guaranteed. This IS Manchester, come on now.